Rangitoto College Senior Shakespeare 2018 presents William Shakespeare’s The Merry Wives of Windsor. This exciting modern romp of a revenge comedy sees an ensemble cast of Rangitoto College’s talented senior students, directed by Allan Roberts, explore jealousy, marriage, deceit and shows Shakespeare’s greatest celebration of women and Girl Power!!! 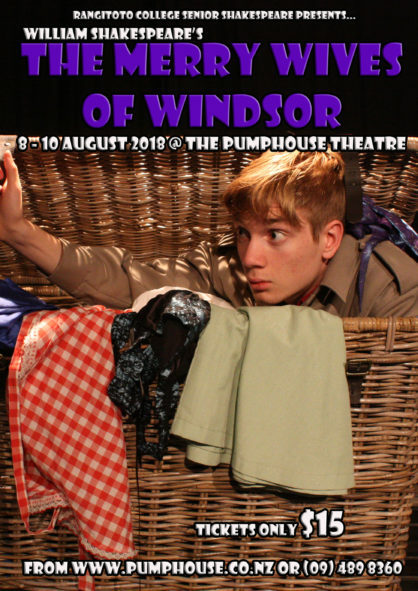 The Merry Wives of Windsor marks the eleventh Rangitoto College Senior Shakespeare production directed by Allan Roberts and the sixth at The PumpHouse Theatre. Students with a passion for Shakespeare eagerly audition each year to be a part of the Senior Shakespeare ensemble. They do it not for grades, but for the love of performing the Bard’s works and the overall challenge of the production experience.